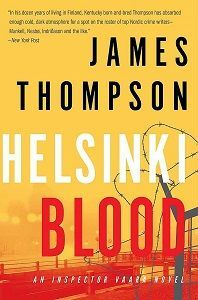 REVIEW OF HELSINKI BLOOD BY JAMES THOMPSON. And so it begins, a raw sense of one man’s struggle against improbable odds, some of which are historical. There is an implicit narrative sense of factors weighing against the protagonist, suitably so, since this is a Nordic novel. There is something elemental to Thompson’s writing, a brackish taste of the Sagas and Eddas beneath the tight prose. The acute visceral physical details the author weaves into his descriptions of his protagonist evoke a sense of inner scarring beneath the Inspector’s tough persona as Vaara battles his own demons. He also struggles to deal with his abandonment by his wife, who is suffering from PTSD, as he is left to care for their infant. Vaara embodies the paradox that the best detectives have strong criminal shadows. Many decisions he makes are a way of ensuring he stays on the right side of a criminal world in which he is an unwanted and belongs. There is nothing safe about the depiction of crime here. There is an immediate sense of its impact on Vaara’s life and that of his wife. And while the first person narrative delivers an intimate portrait, at the same time Thompson delves into the wider picture, exploring the political and economic factors that may aid and abet criminal syndicates. Vaara’s situation is complex. He is a wealthy man. He is also a target for criminals who want his money. Thompson has written his protagonist into a tight squeeze. He takes on a missing-persons case. As he hunts for a 19 year old girl who has Down syndrome and who may have been kidnapped and sold into a sexual underworld, Vaara finds himself at the centre of a political web. Thompson’s exploration of the implications of prostitution rackets raises questions about the economics behind it. It is interesting to note that some of Thompsons’ characters are thinly veiled portraits of politicians and businessmen. He has absorbed Helsinki, he has digested it, and he has expressed it as a microcosm in his fictions. He adeptly balances the feel of Finland with a tight muscular American style of storytelling. He is an author who conveys the private lives of his characters while allowing them to reflect on the wider political implications of the dilemmas they face. Vaara explores a world in which young women go to capitals promised jobs and end up being raped by the clients of criminal syndicates playing the political odds. There is a dual culture at work in Thompson’s fictions which makes him unique among the Nordic writers. Thompson made a smart career move when he settled in Helsinki, for he is perhaps its predominant chronicler, and he does it through a reflective consciousness which embodies all the virtues of great American storytelling, while adding a particularly Nordic flavour that avoids a sense of bleakness through the sheer resilience of his central character and the prose. This is Nordic literature in the elemental sense of order overcoming the chaos that is crime. Vaara may just be that element, a scarred fighter for justice in a world where too many are denied it. He would fit in Njals Saga or Hrafnkels Saga, and yet he is being penned by an American from Kentucky who may have the necessary angle of detachment to observe a society that carries its own denial of the burden of its past. Yet at the same time the novel is highly contemporary. Vaara is up against the mafia. 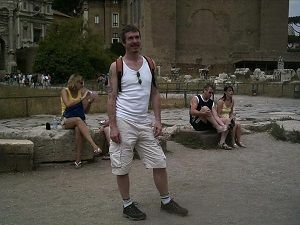 And given the extent of brutality existing in crime and enforced prostitution it takes a man like Vaara to combat it. Thompson lures the reader into Helsinki’s dark heart. But it is Vaara, troubled, ill at ease, but redemptive and worthy, who acts as a central focus for the novel’s action. He is its scarred conscience. He is its beating heart. Hard as a knuckleduster and utterly human, this is a book that does not pull punches. Thompson has painted a starkly realistic picture of the criminal underbelly of Helsinki and he has redeemed it with a great and unlikely hero. For Vaara is not a saccharine saviour, he is an ambiguous character who is also moral. If you want to read crime fiction that is distinctive, read this. There have been many comparisons of Thompson’s style to other Nordic writers, but I think the analogies fall short and miss something that has emerged from the dual culture at work in his novels. He is not a native of Finland and that gives him an edge. Thompson has carved his own particular niche out of the first rate writing coming out of the Nordic countries, and it is one that leaves you thirsty for more. There is a combination here of a precise cold scalpel and humanity. Thompson is an inheritor of Gothic Noir, and creator of the detached and involved, the ruined and redeemed Vaara, an Inspector who embodies all the contradictions that inhabit a life. I highly recommend this. Find James Thompson’s ‘Helsinki Blood’ in hardcover format at Amazon.com, Amazon.co.uk, Books-A-Million, and IndieBound, and in both hardcover and eBook formats at Barnes & Noble. (Kindle format coming soon at Amazon.com). Visit James’ website to learn more about ‘Helsinki Blood‘ and its predecessors, ‘Helsinki White‘ , ‘Lucifer’s Tears‘ , and ‘Snow Angels‘.